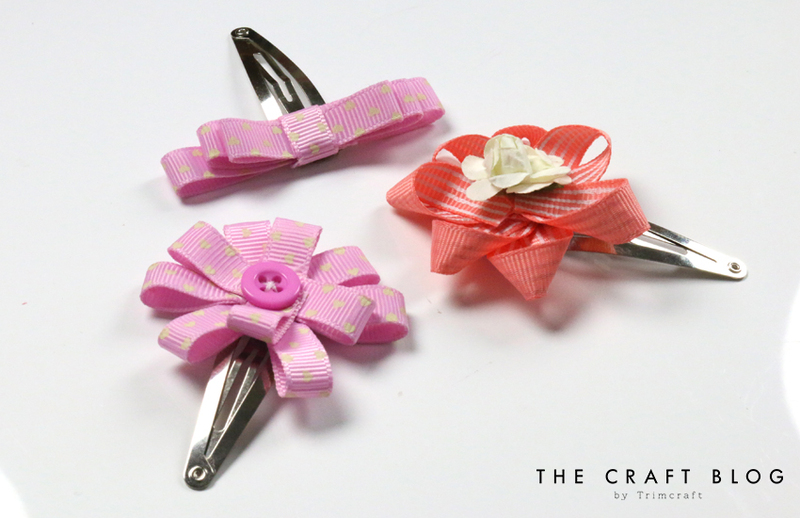 Get pretty with your ribbons as we show you how to make the cutest hair accessories! These adorable bows are so achievable and will make a wonderful gift for the little stylist in your life. 1. Take the Dovecraft ribbon of your choice and cut 7, 6cm strips. 2. Cut out a small circle out from a piece of Dovecraft Felt. 3. Take a 1, 6cm ribbon and fold as shown, sew the ends together, repeat to all 7. 4. Sew the pieces of folded ribbon around the circular piece of felt. 5. Adhere the ribbon flower to the hair clip, we recommend a strong adhesive to make sure it is secure. 6. Adhere the Dovecraft paper flower to the centre in the same way. How adorable is this ribbon bow? Such a sweet accessory as we head into summery days! Or you could use the folder ribbon strips to create a traditional bow and secure it by wrapping a piece of ribbon in the middle, how pretty! How will you use this technique when making your own hair accessories? We would LOVE to see so don’t forget to #trimcraft when uploading to social media and to share your makes in the Inspiration area!